But first, here’s the link to the blog of fellow Society of Animal Artist member and great sculptor, Simon Gudgeon, who resides in the UK. His latest post is an excellent discussion of wildlife art and its place in the larger world of “fine art”. Here’s one bit that I particularly like: “…too many artists use photographs rather than their minds and let the photograph dictate the finished artwork. An artist should observe their subject and decide how they want to portray it, or take a theme or emotion and work out how they can use a wildlife subject matter to illustrate it.” Truer words…. In the meantime, I’m having fun in the evenings, while we watch the San Francisco Giants possibly close in on their first Division pennant since 2003 (tonight might be the night! 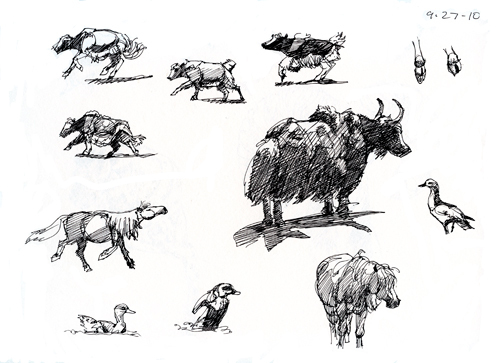 ), doing more quick sketches with a gel tip pen in a Strathmore Universal Recycled sketchbook. Once again, these don’t take more than a few minutes each. If you decide to try this at home, and I hope you do, look for photos of animals with distinct light and shadow sides, using that to emphasize form and structure where possible. 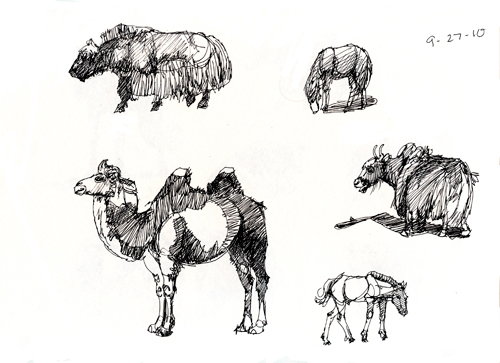 I think you can see below that the most successful sketches have interesting shadow shapes. I also keep each most of the sketches to two values, light side/shadow side. There’s a couple where I added a third, intermediate value because it was a black animal or a black and white animal and I wanted to show the black part in light and shadow. 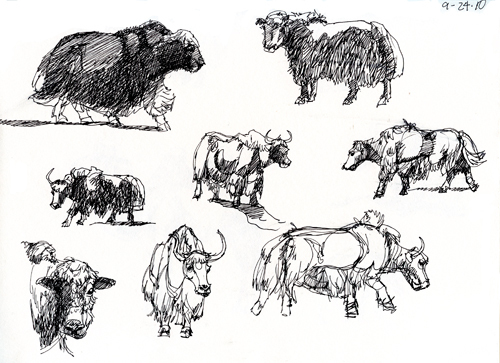 The all-white yaks were actually….black yaks, in flat light. Very nice work! I especially like this 3rd one where I can see you working directly from live subjects… keeping the sketch small… and capturing some essential observations quickly! Nice Work! Thanks, David! But I have to confess, all of them are from photos I took on my most recent trip to Mongolia. 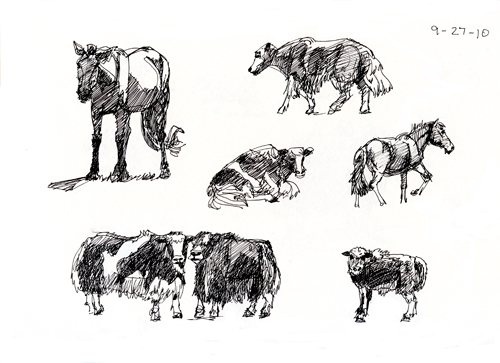 But I do try to approach these quick sketches as if I was working from live animals.